You flew to JFK (John F. Kennedy) Airport and made it safely and now you need to get from JFK to Penn Station, New York. You have heavy or lots of light luggage so what can you do? Well, do not panic as it fairly easy and inexpensive to get there. 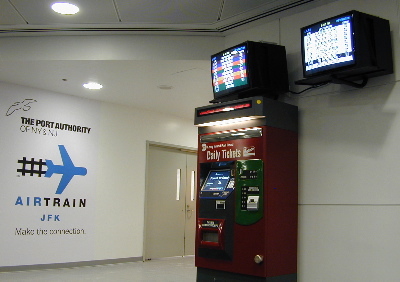 The first thing you will need to do is find the Airtrain JFK. You can find the Airtrain JFK at the terminal and this will take you to Jamaica Station if you do not want to charter an airport shuttle from JFK or taxi cab.. The Airtrain JFK will run mostly elevated to Jamaica Station except for run between Station C: Federal Circle and the airport loop. The fare on the Airtrain is (currently US$5.00) less than US10.00 per person and the trip will take appromimately twenty (20) minutes. Once you safely reach to Jamaica Station, exit the Airtrain so that you can transfer to the LIRR (Long Island Rail Road) where you can take trains (heading westbound) to Penn Station, NY. The trip from Jamaica Station to Penn Station should also take approximately twenty (20) minutes as well. A one way off-peak ticket on the LIRR (Long Island Rail Road) from Jamaica to Penn Station, NY is (currently US$5.75) less than US10.00 per person. If you’re traveling during peak hours the fare is (currently US$8.75) less than US$10.00 per person and if you’re traveling on the weekend the fare is (currently US$3.75) less than US$5.00 per person using the CityTicket. LIRR (Long Island Rail Road) has ticket vending Machines that are near the platforms, so you can purchase your ticket(s) before boarding the trains. Have a fun and safe trip.